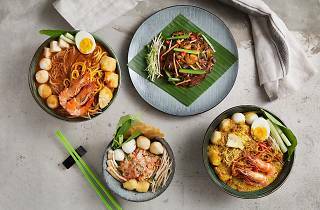 This sleek and stylish Southeast Asian noodle bar comes to Sheung Wan courtesy of founder and head chef Kevin Lim. Lim has pedigree: he grew up in Malaysia before studying at Le Cordon Bleu, in France, and earned his chops at the well regarded restaurant Blue Ginger, just outside of Boston, in America. Decked out in differing shades of green, from mint to teal, the decor is patterned after Malaysian batik cloth. Marquee lights above the open kitchen spell out ‘mean’, presumably a pun on ‘meen’, the Cantonese for noodles, and, we hope, an indicator of the kickass nature of their fare. 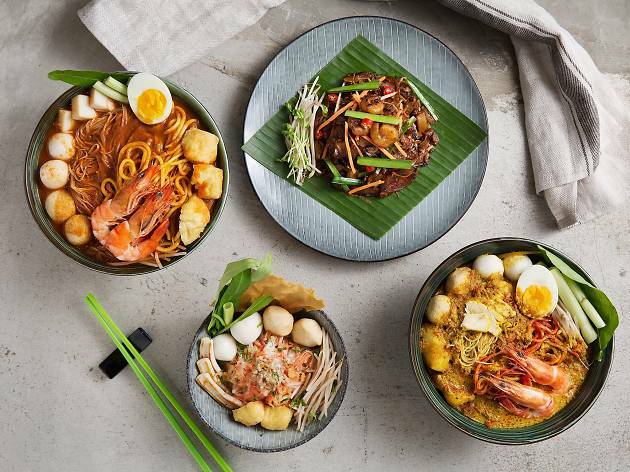 We start with the laksa ($88), a mix of egg and vermicelli noodles topped with prawns, fish balls, tofu puff, bean sprouts, kangkung (water spinach) and half a boiled egg. Sadly, the broth lacks depth and we long for more coconut milk. The thin, bland broth does nothing for the soup and toppings, and a tastier soup might have provided the requisite oomph. Things pick up with the Thai yen ta fo heng ($88), AKA pink noodles. The dish owes its pink hue to red fermented tofu finished with a mix of vinegars, chillies and a pinch of pepper. It’s served with white rice noodles topped with fish balls, squid, tofu puff, kangkung, bean sprouts and a crispy wonton chip. The squid is an ordeal to chew but the fermented tofu has a unique sweet aroma that’s perfect for anyone that’s a fan of fermented foodstuffs, yet also mild enough for those who aren't mad on pungent flavours. The Indonesian gado gado ($68) – a generous portion of cabbage, water spinach, cucumbers, boiled eggs, fried tofu and crispy tempeh topped with a deliciously moreish peanut sauce – ends things on a high note. Mean Noodles certainly looks hip, and though it isn’t quite as badass as its name would suggest, it does fill a hole without emptying your wallet.